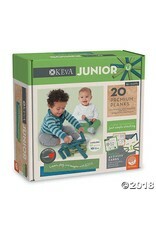 KEVA Junior - Grow Children's Boutique Ltd. The oversized planks are perfectly sized for young hands to grasp and nicely weighted to stack effortlessly. Plus, these environmentally friendly wood-composite planks are made from recycled material. The wood fibers are reclaimed during the manufacturing of other wood products, so no new trees are cut down to make KEVA Junior. The planks are top-rack dishwasher safe and can be sanitized—making KEVA Junior the perfect choice for day-care centers, schools, hospitals and other institutions. The surface is smooth and the planks will never splinter. 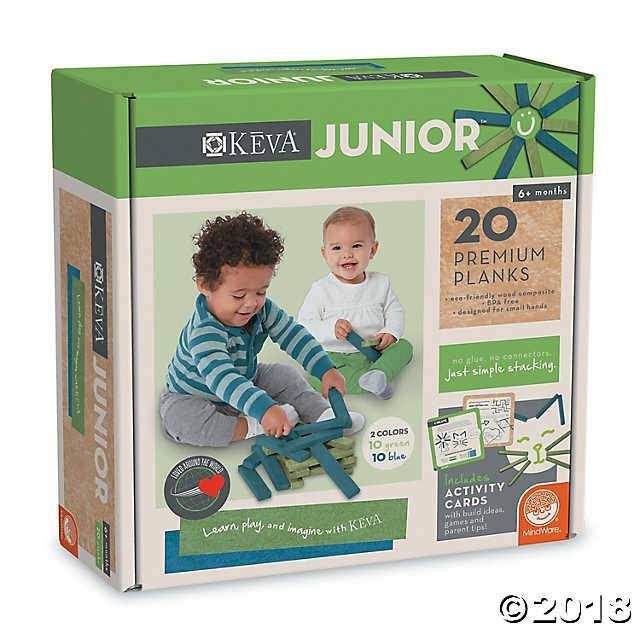 With KEVA Junior, children as young as six months can begin developing skills such as problem solving, spatial sense, motor skills, and so much more. The 20-piece set includes 2 colors of planks so children can make patterns and practice sequencing as they develop.